In this post I'll go over various options for scaling your business web platform. We'll take a look at five different approaches. There is no wrong or right approach, it is just a matter of what aspects you want to emphasize and what your real world needs are. I'll be using the Amazon stack in examples as it is my preffered stack of choice, but the strategies shown here apply to every other competing stack as well. First let's go over some concepts: region and availability zone. If your platform is working mostly in one area of the world it makes sense to put your servers in that region. The region will then have mulitple "Availability Zones". This means that you can put redundant servers in different zones within same region and as a result you'll have better availability. The important twist here is that within the same region network latency is minimal. So we have separate facilities with good interconnectedness. 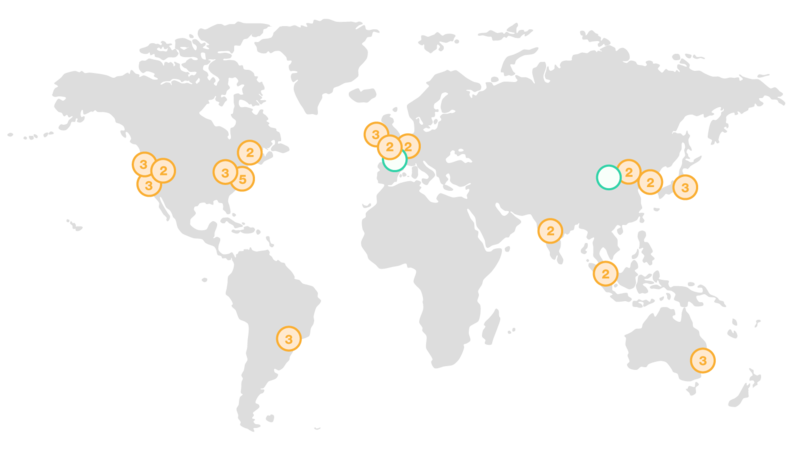 Here is an image of the available regions along with the number of available zones on AWS. Two green circles are new regions that are opening soon (in Paris and Ningxia). Things are simple here, you have one machine that serves all your traffic. When you notice that the server can't handle the traffic you simply shut down your machine, upgrade the CPU, RAM and storage and you run it again. This approach is the cheapest and is ideal for the MPV state. Don't be fooled, though, it still can get you very far and I would most definitely always begin with this approach. This is similar to having a single machine in the sense that if our availability zone goes down, production goes down too. So our server(s) live in single region inside of a single availability zone. We are merely adding an Elastic Load Balancer that distributes traffic to multiple servers within the same availability zone. It is much better to use the approach #3 with multiple zones. This can be used when the load is so low it requires only one server (so it has to be in one availability zone) as a stepping stone in the right direction. When we combine multiple availability zones it means it makes it very unlikely we will have an outage. Elastic Load Balancer can detect problems in each zone and redirect traffic to healthy instances. This combination is a sweet spot for reasonable realiability and cost. 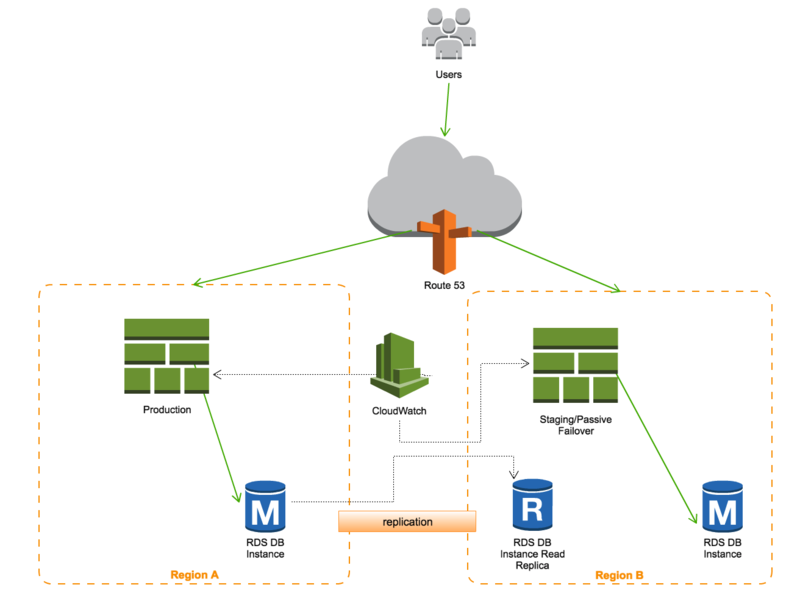 Such a setup requires the database to be synced across regions. Total time from end point failure to DNS failover is about 3 minutes, so we can have a backup server running soon, preventing big outage. One possibility to cut down cost is to use a passive setup as staging area for testing prior to production rollout. 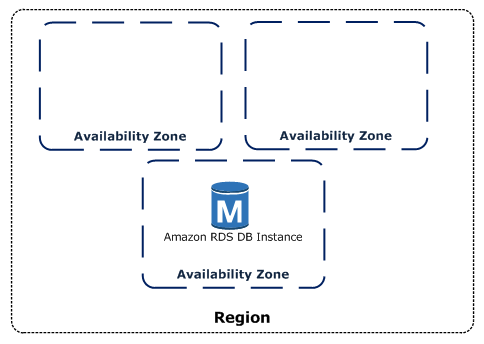 When your server handles lots of customers across multiple regions it makes sense to keep both regions active. 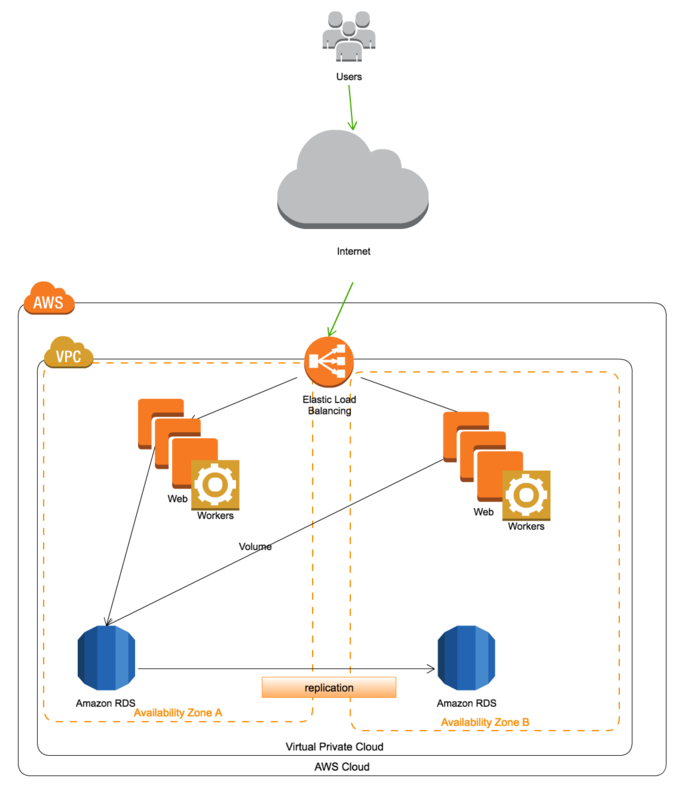 In normal circumstances you might use Amazon Route 53 Latency Based Routing (LBR) or Weight Round Robin (WRR) to distribute load. In case of emergency when an entire region goes down you transfer the traffic over to a working region. his means you get slower responses, but it certainly beats suffering complete downtime. The configuration is exactly the same as #4 Active/Passive Failover but we use both regions and we distribute the load between them at all times, not just in case of one region going down. Another good tip is protecting web servers from being burdened by using a CDN for static content delivery or streaming. DDOS protection is another valid concern. If you are in search of an awesome RoR team, or you need help with setting up your project you can ping us here. In this post we'll describe on how to use OmniAuth in combination with Rails and Devise to support authentication of existing and new users without asking for email/password combinations. In this post I'll try and describe how to set up SSL for your Rails app. This solution is free and will automatically extend the certificate once the certificate runs its course. So, you’ve decided to build a new disruptive product that will earn you glory and money? Congratulations… welcome to the club and good luck! Almost a year has flown by ever since I started learning programming from scratch. As a result of that, I am writing this blog post to help new and old developers with some tips I learned in this beautiful world of programming. If you were to ask yourself – what is the essence of any software system – what would you say? (that is, what would you have said without having read the title of this post 😃).